May 9 started out just like any other day for scientists and students participating in the Center for Severe Weather Research’s TWIRL project. The group’s fleet of mobile Doppler on Wheels (DOWs) and observation vehicles had already made their way some 800 miles from their Colorado home base to south central Oklahoma, looking to intentionally place themselves in harm’s way. And on this day, boy did they ever. Why would somebody do such a thing? Science, of course. TWIRL stands for “Tornadic Winds: In-situ and Radar observations at Low levels.” In plain English, these researchers want to understand better how tornadoes form, their strength, and how their winds do damage. The hope is by getting data at the surface often missed by stationary radars dozens if not hundreds of miles away, a better understanding of this killer weather phenomena will save lives later through improved forecasts. The gist is this: researchers find a promising tornadic thunderstorm and park their DOW trucks at a safe distance, typically less than a mile away, and start scanning the storm once every seven seconds. At the same time, another team gets much closer, perhaps a matter of a few hundred yards, and places a line of mobile observation pods — packed with a wind, temperature, pressure and humidity sensors — directly in the storm’s path. Although it’s not a perfect method, due to the highly unpredictable behavior of tornadoes, the hope is that at least one of the sensor pods will be hit head on. If it is, the data collected by these pods will be invaluable to the team’s research. If this sounds like something you’ve heard about before, it’s probably because you’ve seen Twister. The 1996 film featured a fictionalized account of tornado researchers attempting to place pods in a tornado’s path — something that weather researchers have been trying to do for the past 35 years, with little success. Only infamous storm chaser Tim Samaras –who later died chasing the May 2013 El Reno, Oklahoma tornado— and the TWISTEX team have had any significant success getting sensor pods close to a tornado’s core. Such a low chance at success generally translates to a lot of time on the road, since much of the team’s time driving from one point to another. There’s often a lot of frustration, and the living accommodations aren’t always the best. “Being in a different hotel every night means never really unpacking, never getting a decent meal because when TWIRL usually arrives in, its well after restaurants close,” Wurman said. The team can often be found grabbing meals from convenience stores or racing to get laundry done, and is usually late to arrive and early to leave whatever random hotel it lands in. But Wurman says the people who sign up for these missions know what to expect, and are selected because they’re fit for the task. “It’s a difficult way to live,” he admitted. The group has been on the road for much of the time since TWIRL began on May 1, and will head out every time between now and June 15 when significant severe weather is present. The team expects to travel about 15,000 miles, since it’s willing to go just about anywhere –Colorado, Iowa, North Dakota, and even Texas– to track down a big storm. But there’s also downtime, which allows the team to analyze the data it collected and regroup back at its headquarters in Boulder, Colorado. It’s also a time to catch up with other tasks, like regular maintenance or repairing damage to broken equipment. 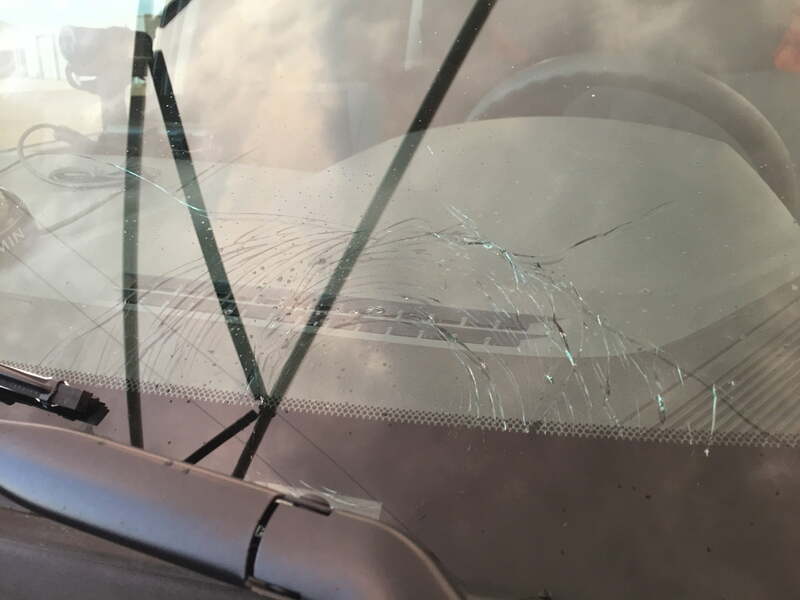 This past week was one of those cases: while chasing storms in the Texas panhandle on May 15, several vehicles ran into hail the size of softballs and even larger. As you can imagine, CSWR maintenance teams had quite a few broken windshields to replace and dents to pull out. Perhaps another key part of TWIRL is the participation by students, whom as future meteorologists have far more advanced tools at their disposal than even those just 10 or 20 years ago. These students are the future of the field, and gaining in-person experience with CSWR’s high-tech equipment will make them better forecasters. Left to right, Molyneaux, Marshall, and DeFlitch with the damaged Pod O. One of the lucky few getting to participate is Millersville University senior and meteorology major Brandon Molyneaux. While his focus in school is on severe storms and he already has some storm chasing experience under his belt, Molyneaux says working with CSWR is the opportunity of a lifetime. The May 9 event put CSWR’s tech to the test, though. On the pod deployment team, DeFlitch and Molyneaux as well as meteorologist and CSWR volunteer Tim Marshall were responsible for deploying the pods ahead of the storm. By the time it reached the three, the twister was over a mile wide with winds exceeding 200 miles per hour. A YouTube video shot by Basehunters Chasing shows how close they were (watch through about 4:00). “We know that the pod deploying team experienced winds of 80-100 mph,” Wurman told us. But they wouldn’t know if they were successful until minutes afterwards when the EF4 tornado had safely passed. Then something many on the team had waited years to hear came over the team’s radios. “We got a hit! I repeat, we got a hit! Pod O took a hit, and has sustained damage!” Marshall exclaimed. A look at the data later confirmed that while the pod itself had not made it into the core, in the least it was further inside a storm than they had ever gotten. One of the wind sensors was destroyed in the encounter (although a backup sonic wind sensor continued to record data the entire time). The yellow paint on the pod was pitted, and the entire 120 pound pod itself moved about six feet from where Molyneaux and DeFlitch had placed it. Digital Trends has learned that the pod measured winds of 100mph at ground level, and this was only on the outer edge of the circulation (the true center of the circulation was about a half mile to the south). There was tons of other data collected which is not yet ready for release, however comments from team members on social media seem to indicate they have quite a bit of exciting data to release in the coming weeks and months. 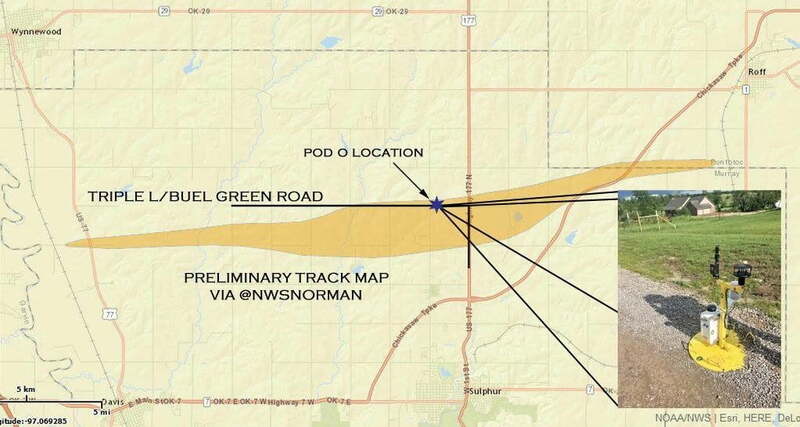 The tornado’s track along with the location of the pod. So based on what they’ve found — and hope to find through the next several weeks — what benefits will you or I see in the not-too-distant future? Much improved understanding of tornadoes and hopefully better forecasts, they hope. For example, answering the age-old question among meteorologists as to why some supercell thunderstorms produce weak tornadoes while others produce large and strong tornadoes like the May 9th event or past events like Joplin, Missouri or Moore and El Reno, Oklahoma. Could studying these big twisters up close give a better indication of where and when it will form, and how strong? And how about these low level winds. Could we discover something here to lessen the destructive power of nature’s most violent weather phenomena? “The answers to these questions are important for producing better forecasts, better warnings, and safer Springs for those who live in Tornado Alley,” Wurman said. With a mission like that, maybe CSWR’s team of researchers aren’t so crazy after all.